Lidar is one of several techniques for measuring the 3D structure of an object. The figure below indicates how a direct-detection imaging lidar works. A short pulse of light illuminates the scene. A small fraction of the light scatters back toward the sensor, is captured by the optics, and is focused onto the detector. The detector converts light into an electrical signal which can be digitized electronically and recorded. In Geiger-mode systems the detector is a large array of thousands of individual detector pixels, each digitized separately. The time of arrive of the light, relative to the transmitted pulse, gives the range to the target since the speed of light in the atmosphere is well known. Given the ranges measured for each pixel, and knowledge of the platform position and orientation, simple trigonometry is used to place a point accurately at a particular latitude, longitude, and altitude on the planet. After collection of millions of such points, the product is called a 3D point cloud. 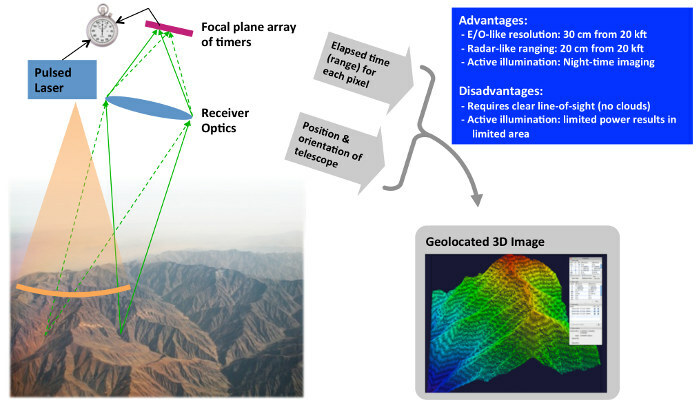 Compared to other 3D imaging modalities, such as interferometric synthetic aperture radar, lidar has better cross-range resolution. Compared to passive imaging, lidar can work at night and directly senses 3D information with resolution independent of range.